As Walt Disney World park guests pass hurriedly through Frontierland to join the queue lines for Splash Mountain and Big Thunder, many will be blissfully unaware of the history attached to this corner of the park. A conceived but unrealized attraction, Disney's Western River Expedition & Thunder Mesa have now become something of a legend amongst Disney Imagineers and officiandos. The Western River Expedition attraction destined for Walt Disney World, situated in the North Western corner of 'Frontierland' was to be a grand and ambitious attraction, an advancement in technology anticipated to become the 'Pirates' for Florida. During the 1960's, with the Master Planning of Walt Disney World well underway, The Disney Corporation had taken the decision to exclude the Pirates of the Caribbean attraction from the new Florida project. Believing that local folklore made the swashbuckling adventures of pirates too familiar to local park guests, Disney executives instead requested that Imagineers of WED enterprises begin development on the Western River Expedition as the solution. Design work began in haste. Primary responsibility for the design of the attraction fell to the legendary imagineer Marc Davies, who proposed a bigger and better 'wild west' themed version of the pirates attraction, believing this would be more exciting and less familiar for Floridian visitors. As the concept expanded, it centered around a large rocky backdrop feature named 'Thunder Mesa Mountain' hiding the large expedition show building behind, it would also house a Runaway mine-train ride, penciled to be the first roller coaster in the park. The project was forecast to be one of the largest at three times larger than splash mountain, most technologically complex and most costly attractions to have ever been built. Over a period of some five years, ride concepts, large scale models and diorammas, characters and back story were developed in extensive detail. Outside, guests would experience walking trails, indian villages and mule rides around Mesa mountain as well as the runaway mine train with a planned 'reverse' section. Whilst inside the river expedition, Guests would pass through a twilight queue line & board a freight levy for a western themed boat journey narrated by Hoot Gibson (an audio-animatronic owl). 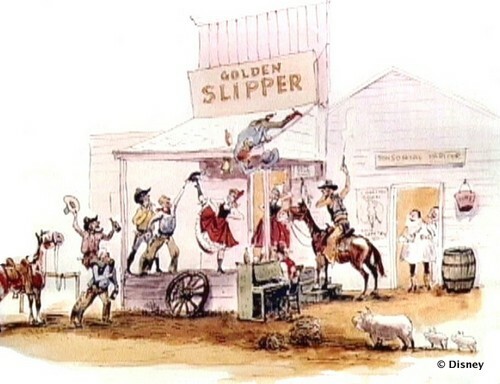 Backed by a catchy Disney theme tune, launches would pass though wilderness scenes, a stagecoach robbery, encountering locals of the town of 'Dry Gulch' featuring multiple audio-animatronic characters & the legendary Marc Davies humour, before finally escaping the stagecoach bandits down a flume style drop. WED initially forecast construction to be completed within five years of opening of the Magic Kingdom park, certainly an ambitious project but one which Disney clearly seemed committed to. Disney invested heavily in the project and even featured it in promotional material to entice visitors to return in the years following the opening. What became of Western River Expedition? Unfortunately despite the concept being well received when presented to the Disney management, the final green-light for the attraction failed to materialize and the project ultimately stalled. There were many contributory factors behind the failure. Once construction had completed of the first phase of Magic Kingdom, on opening in 1971, expectant crowds flocked to the new resort to discover a distinct lack of any Pirates. Disney had severely underestimated the popularity of the pirates ride and with the River expedition still at design stages, it left irate guests questioning 'where are the pirates?'. The Complaints poured in. This forced the hand of Disney Productions (now headed by President Card Walker) to forge plans to rush through construction of a Pirates ride ready to be opened by 1973, diminishing the need for another major attraction and using much of the budget ring fenced for the River Expedition & Thunder Mesa. Economic downturn coupled with phase two expansion of Tommorowland (with many new attractions) in the mid 1970s meant that funds & resources were prioritized elsewhere and plans were continually postponed with a view to a future completion. It is also believed that some Disney executives harboured concerns over the stereotypical representation of Native-Indians. However the main underlying curse was the huge projected cost and Disney management simply could not see any inherent benefits to the investment. Once construction began in 1979 on Big Thunder Mountain Railroad - a stand-alone re-imagining of the planned Thunder Mesa minetrain - on the land secured for Western River Expedition it was a decisive indicator of future commitment to the scheme. Despite attempts by Marc Davies to save the 'Thunder Mesa' concept and incorporate into the new proposal, these never came to fruition. With the announcement that focus was being diverted to the construction of EPCOT Center for an opening in 1982, any hope of realising the concept were effectively snuffed and the attraction was destined to the annals of Disney history. Despite the shelving of the project, Walt Disney Imagineering (WDI) has over the years managed to adapt some of the conceptual ideas and introduce these elsewhere. Tony Baxters reimagined minetrain attraction 'Big Thunder Mountain' was perhaps the most successful idea to emerge and encapsulates those western themes outlined in the original concept and is now included in various incarnations across four Disney Parks. In 1992, over twenty years after the initial expedition concept, WDW's Frontierland finally received a water ride. Although themed to the film 'The Song of The South', Splash Mountain derives many of the elements of the Western River Expedition attraction. Furthermore at EPCOT, the prairie scenes of 'Living with the Land' and portions of the now defunct World in Motion attraction were inspired from the original concept drawings. In 1993, the development of the plans for the new Disneyland Resort Paris opened up more opportunities for the imagineers to integrate elements of the Western River Expedition. Taking inspiration from the original idea, Frontierland's fictional town was named 'Thunder Mesa' and heavily references the characters and back story throughout. The Phantom Manor Canyon scene portrays a twisted and horrifying representation of the inhabitants of 'Dry Gulch'. The Paris resort also features arguably the definitive, most detailed and exciting version of Big Thunder railroad, a culmination of the evolution of the original western theme concept inspired by the original idea. The Legacy of Western River Expedition? Whilst never realized, the Western River Expedition has left a legacy within Disney parks and in WDI. Many guests will undoubtedly have experienced elements of the original concept in some way. The evolution and influence of the design also clearly highlights one of the key governing principles employed by WDI. continually revisiting past ideas, exploring, reworking and improving even if seemingly impossible, too wacky or irrelevant. Inspiration for the next big attraction may be lurking in a past design just waiting to be rediscovered. 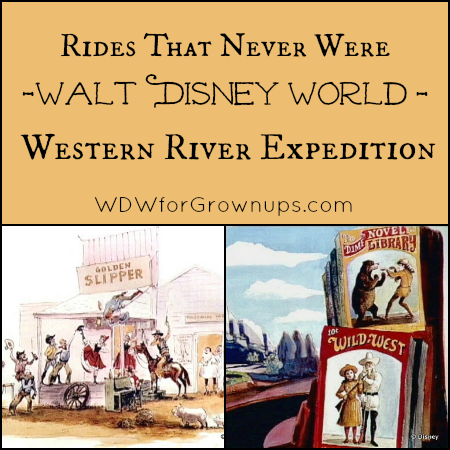 Remember Walt's mantra "Disneyland will never be completed as long as there's imagination left in the world" and One day, Western River Expedition, the most famous ride that never was, may yet grace a Disney Park. Thanks so much to Simon Watson for this great guest post, we look forward to see many more stories of attractions that never were from him in the months to come. This post was fantastic!! I never knew about this and I am certainly excited to find out about more attractions! Although I love Pirates and Big Thunder, I still wonder what could have been if Disney had stuck to their guns and built the Western River Expedition. While some of Marc Davis' portrayals of Native Americans would have needed a lot of help, it could have been something truly unique to Disney World. It's one of the great unknowns from the Disney past of what could have happened. I LOVE learning the history of Disney and the Imagineering team's ideas. Both those that came to fruition and those that only went to conception and possible "fleshing out." I'm still intrigued and still hope for Beastly Kingdomme to make its place at Animal Kingdom in the future. It is nothing against Avatar's Land, which is under construction. But I was working at WDW when Animal Kingdom opened. I was so looking forward to Beastly Kingdomme and will ALWAYS be a proponent of it. Maybe they should have realized Pirates would have been popular because Floridians are so familiar with them. I personally think if it ever were to open an attraction similar to this one, it would be best to see it or at least parts of it as a cracker western. That's something else Floridians could get behind and introduce to the rest of the world. Love this article. Please write more like it!